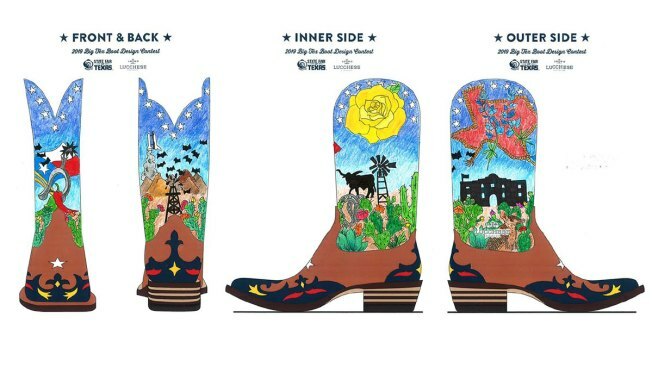 Katie Sauceda, of Keller, designed this pair of boots that will be worn by Big Tex during the 2019 State Fair of Texas. With only a couple of hundred days until the State Fair of Texas kicks off Sept. 27, organizers are showing off the new boots to be worn by Big Tex during the fair's 24-day run. 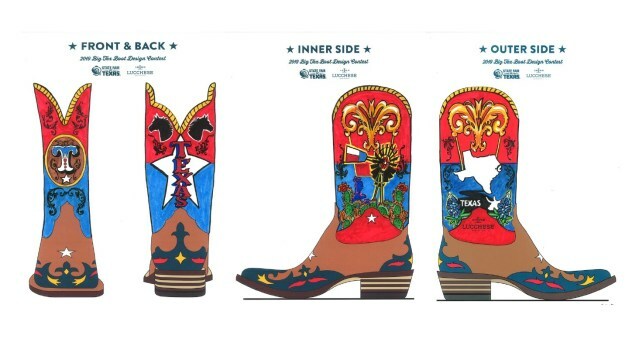 Big Tex's size 96 boots are chosen as part of a design contest held annually to help plan the big guy's footwear. From a field of more than 250 submissions, the final 10 were chosen. From that group, one design emerged as the favorite -- the one put together by Keller's Katie Sauceda. Sauceda told NBC 5 she created her design in about six hours, though she did it here and there as her newborn napped. She said though she's won some drawing contests in the past, she was really surprised to win the state fair's competition and was very excited to see the final product. Sauceda's design (seen at the top of the page and in the Top 10 finalists slideshow below) features of a number of Texas icons including the state's flag, a spur, some bats, a Space Shuttle, some prickly pear cactus, an oil derrick, a windmill, longhorn, a yellow rose, an armadillo, bluebonnets and, of course, the Alamo. There's not much missing from the boots, but Sauceda, who is originally from San Antonio, told NBC 5 the one element she would like to have worked in was floating the river -- something she recalled doing a lot growing up in Central Texas. touches on her boots as they are stitched together. The State Fair of Texas, with this years apropos theme of "Celebrating Texas Creativity," kicks off Sept. 27 and ends Oct. 20.